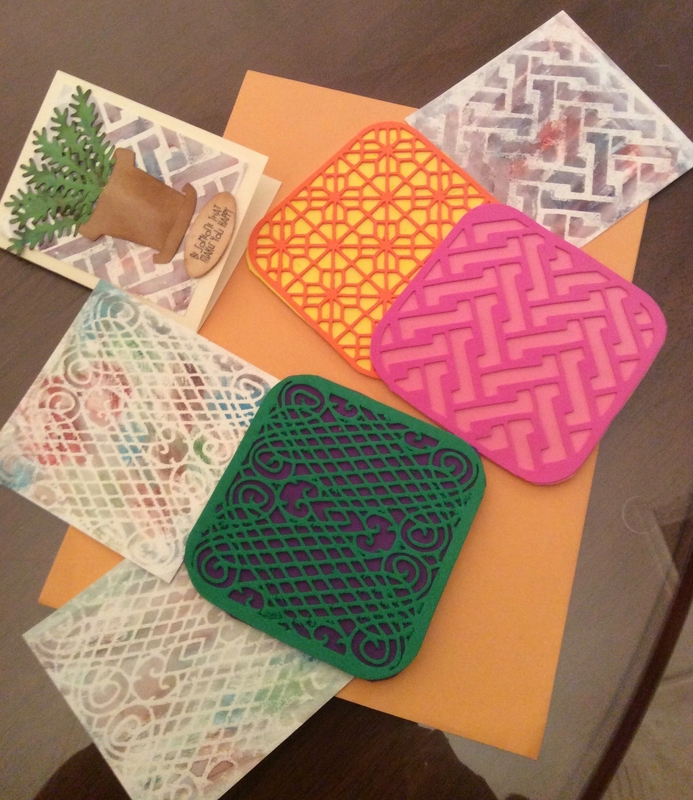 I shadowed some of Diana's frets to make background stamps out of adhesive fun foam that I cut on my knk force. Still working on the settings cause it is annoying to cut something that is so soft. I stamped the image on water color paper and then embossed the stamp. After lending distress ink with water , I removed the embossing powder with an iron. Those look good and you are definitely having fun. Like the idea of turning them into stamps. Have a look at Griddles under frets I think you might find some more that you like within shapes not just squares. Not so much fun getting the force to cut this adhesive fun foam but better than the alternative - doing it by hand. I wasted a lot of pieces already - good thing this is cheap. You will note that I did change your frets some by shadowing them so that the negative parts where the stamps impresses is thinner. @leslie6111 another very clever idea, making your own stamps. After trying to emboss just cardstock over soft kitchen drawer liner I am reluctant to even attempt craft foam on my Zing. Very good idea!! Repurpose it into a stamp instead of a stencil. Bev, I think you might have more success with the zing with adhesive craft foam since the blade is not as pushy with soft material. I was able to cut soft vinyl remnants on the zing but not on the force for embossing folders. @leslie6111 thanks for the suggestion. Have added it to my shopping list; willing to try anything to get some embossing out of this machine.